Register today to join in with discussions on the forum, post comments on the site, and upload your own sheets! You must be logged in with an active forum account to post comments. @Saft1234 That's Mario using the Fire Flower and him climbing. Thanks! Really helpful! What are the two last fire mario sprites called? @Saft1234: Pretty much, but you missed a couple. Idle , Crouch , Walk , Skid , Jump , Swim , Climb / Pole , Shoe , Die , and Level Start . Yes, and the other is idle, crouching, waking 1-3, skidding, swimming 1-6, climbing 1-2, dead right? @Saft1234: You mean the ones in the very top-right? What about the sprite where mario is entering a level in game? I believe that's called Skidding. Basically the same way how cartoon characters did it, often with the sound of screeching tires. What are those sprites when mario turns after running called? Added the "discarded" sprite for Dr. Kawashima. Added the "discarded" sprite for Undodog. Added the "discarded" sprites for the Callie and Marie costumes. Added the "discarded" sprite for the Shaun the Sheep costume. Me or there's a sprite mario as if "Slipping" as SMB3 ?? it may be that in the future put the tiles to slide? Talk about counting your chickens before they hatch, I just found a way to get at 'em. Added all of the "discarded" sprites for the event costumes! "Because of the way Super Mario Maker has it set up, so that Nintendo doesn't have to push out an update for each individual costume, they made it so that the game downloads all of the current Event Course-based costumes to the hard drive as soon as you go to the Course World. None of them (minus Wolf Link, because that's can also be unlocked from the amiibo) are actually in the patch data." So unless you can find a way to locate and extract those files, I can't add 'em. Where the hell is Daisy, statue Mario, and the rest of the DLC? Added the "discarded" sprites for Wolf Link and the 12 extra costumes in the v1.40 patch. @Nyuha: That uses in-game resizing, it's not actually missing. This sheet is missing the most important sprite... the growing sprite (when Mario gets a mushroom) I watched several videos and that sprite is not on the sheet its slightly bigger then the old NES sprite when Mario grows. Please add it to this sheet i don't want to use the old animations! Isn't there a dynamic Mystery Mushroom? 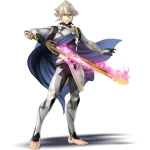 @Corrin: I don't think I saw those in the game files, so I can't say much about 'em, and by "discarded" I meant the sprites on the bottom of this sheet that fly away from Mario if you get hit while using 'em. Should've been more specific. Anyway, updated the sheet with the Fighter Fly and the "combo" Fire Flower. @Random Talking Bush There is an interesting sprite of (modern-colored 30th anniversary amiibo & the "discarded" costume Mario) Mario swimming without his gloves. Is what is it used for? P.S. Is there an "appeal" sprite for the "discarded" costume Mario sprites? @bouncywheel10: To be honest, I'm not sure, but the sprite name for it is "appeal", which is used for the "taunt" on the Costume Mario sprites. What's that 3rd dot Luigi/Lanky/Weird Mario has on his chest in that final sprite for him?